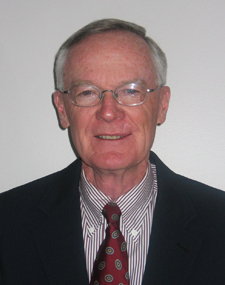 Reed Archibald graduated from Utah State University in 1963, earning a bachelor's degree in business administration with an emphasis in personnel administration and a minor in economics. Mr. Archibald's friends from home in southern Alberta, Canada, chose to attend USU, and he followed them south. His memories of campus at that time were of a fun and social atmosphere with many friendly people. Most importantly, he recalls how much he enjoyed his classes. The professors knew the names of each of their students and spent time in the classroom debating current issues. Mr. Archibald especially remembers his advisor, Professor Glenn Marston, who had a large influence on his career. Others who stand out in his memory are Professor Durtschi in economics and Professor Murray who taught labor economics. Following graduation, Mr. Archibald returned to Canada and was employed by the Hudsons Bay Oil & Gas Company in Edmonton, Alberta, where he had worked as a student in the summer. During this time he met his sweetheart Caroll and they married in 1964. Mr. and Mrs. Archibald moved to Calgary, Alberta, where he was employed by the Pacific Petroleum Company in 1964 and later the Mobil Oil Corporation in 1966. In 1974, he took a position with the Occidental Petroleum Corporation where he served as an executive for over twenty years, gaining experience in domestic and international human resources. He provided the leadership and vision for a human resources function that led to organizational changes and business-driven solutions. His focus was on change management, organizational development, and innovation in human resource operations, including the development of global strategies, policies, and practices. He began this 23-year journey at the Canadian Occidental Petroleum Ltd. in Calgary, first as the manager of human resources and then as the vice president of industrial and government relations in 1977. He was responsible for directing human resources, environmental management, health, safety, and government relations for this Canadian subsidiary. In 1979, he and his family moved south to Bakersfield, California, where he worked as the director of Human Resources for the Occidental Oil and Gas Corporation. In 1981, he went to Houston, Texas, where he served as the vice president for human resources with the Occidental Chemical Corporation and three years later to Tulsa, Oklahoma, where he held the same position with Cities Service Oil and Gas Corporation. Beginning in 1986 until 1997, Mr. Archibald’s work took him back and forth between Bakersfield, California, and Tulsa, Oklahoma. During this time he served as the vice president of human resources and services where his responsibilities included worldwide functional responsibility for human resources, materials management, environmental management, health, safety, real estate and general services for an organization of 6,000 employees operating in up to 30 countries. Mr. Archibald and his wife are parents of three children–Kelly, Justin, and Tyler. Following retirement, Mr. and Mrs. Archibald built a house in Anacortes, Washington, on Fidalgo Island. They spent many years visiting their condo in Park City, Utah, for ski trips, and when their children decided to make their homes in Salt Lake City, they decided to move and call Park City home. He continues to consult on human resources issues as an independent consultant, and he likes to spend time on the slopes, not only skiing but as a host on the mountain at the Park City Resort. In his spare time, he volunteers in the governor’s office for the Department of Economic Development.